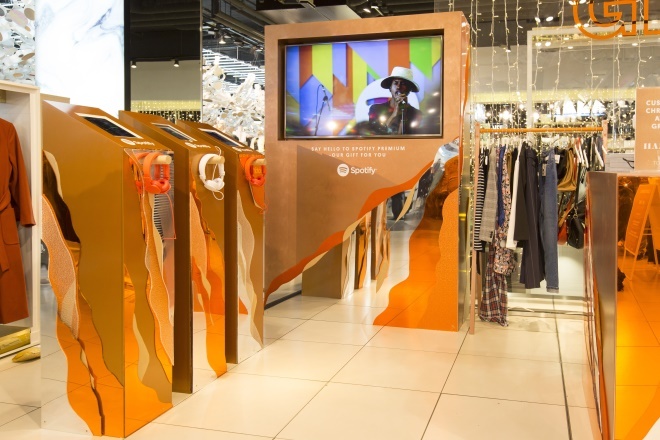 Spotify has launched its first physical retail presence in Topshop’s flagship store. Topshop has partnered with retail property start-up Appear Here to launch pop-up concessions in its flagship Oxford Circus store. The tie-up forms part of Appear Here’s In Residence project, for which the start-up is collaborating with various boutiques and department stores to offer exclusive space for pop-ups in store. Spaces available to rent in Topshop’s flagship store include market stalls, concessions and event spaces. The fashion retailer has registered three years’ worth of demand for space since the partnership began in September. Brands that have set up shop in the store include music streaming service Spotify, which has launched its first physical retail presence in Topshop. Founded in 2013, Appear Here enables brands to book pop-up retail spaces online by the day, week or month. The start-up is intended to give brands of all sizes exposure to a larger audience through a retailer’s store network as well as differentiating the in-store experience for shoppers. Over the course of the last year, 2000 brands have launched pop-up shops using Appear Here’s service across London. Known for enticing people with stunning interiors, Jigsaw’s new store in Westfield has gone the classic design route with a wooden ceiling.